Indian food is one of the food genres that we know very little about; there are numerous regions and cultures within India that each have an accompanying set of flavors and spices to differentiate their cuisine. As much as we love the lunch buffet at the local Indian restaurant, I couldn’t tell you what came from where, much less what’s in it. Given that claim of expertise, aren’t you glad you came to us for an Indian recipe?! There are a few things we do know about Indian food – some basic spices (curry blends, coriander, cumin, etc. ), some basic ingredients (dried lentils are now a staple), and an expectation to try new and different things. As we’re exploring Indian food, however, we’re taking it slow and trying recipes that are more on the beaten path before breaking off into uncharted territory. 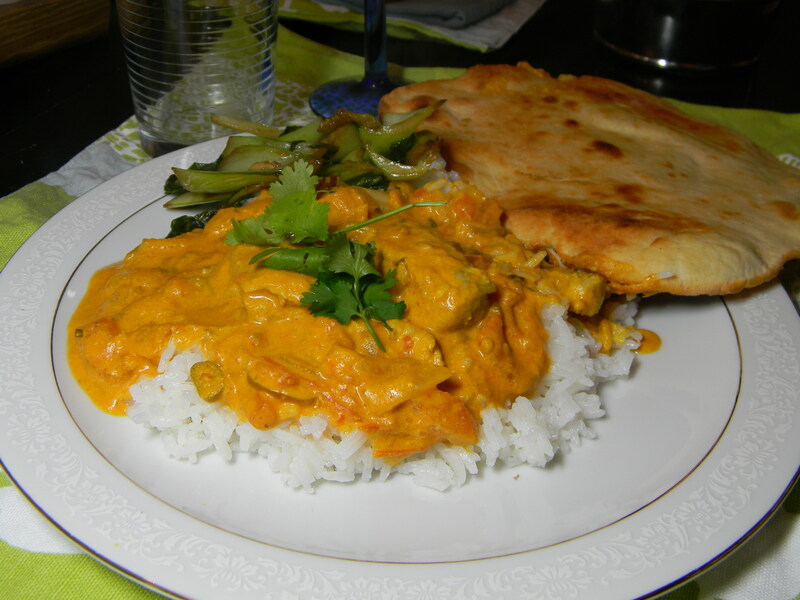 Today, we have a recipe for butter chicken, a delicious dish that you can probably find at most Indian restaurants. We didn’t create this recipe ourselves, so don’t worry about our disclaimers above about our personal knowledge. This dish is perfect with a fresh plate of rice and some homemade naan bread – let us know what you think! I just tore out a recipe for butter chicken from my latest Penzey’s magazine– anything with the word “butter” in the title is ok by me! Your version looks delicious!